Back on March 1st, we wrote about the Mississippi Republican Chris McDaniel, who wants very badly to be a US senator and who was at that time planning a primary battle against incumbent Republican Senator Roger Wicker. In some Republican camps, McDaniel is considered as unelectable as Roy Moore turned out to be in Alabama. 1. The other Republican senator, Thad Cochran, suddenly retired because of ill health. Chris McDaniel ran a primary against Cochran in 2014 and almost beat him. Chris McDaniel naturally decided that he'd rather run for Cochran's seat in the special election this November to complete Cochran's term. Leader Mitch McConnell to appoint himself. McConnell reckoned that Bryant would be the strongest Republican for the November ballot. 3. Governor Bryant did not appoint himself. He appointed his Commissioner of Commerce and Agriculture, Cindy Hyde-Smith, a former Democrat not that well known in Mississippi and totally unknown in Washington, DC. 4. Robert Costa et al. report that Hyde-Smith "received a frosty reception in the West Wing." 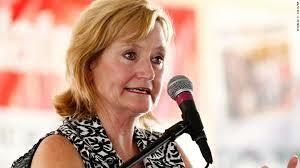 They don't think she can beat McDaniel, and they think McDaniel could become another Roy Moore type embarrassment. Governor Bryant pushed the White House for a quick endorsement of Hyde-Smith. President Trump has withheld his endorsement. 5. The White House's political director, Bill Stephen, scheduled a secret visit with Hyde-Smith yesterday. "It was unclear whether the gathering would forge a thaw in the troubled relationship or move the president any closer to endorsing Hyde-Smith" (Costa et al.). will advance to a runoff, regardless of party affiliation. "Party strategists worry about a runoff that could include McDaniel and a Democrat, giving them two undesirable choices." 7. 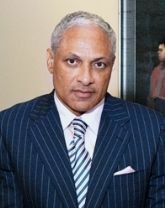 The Democrat who might arise to challenge McDaniel: Mike Espy, formerly Mississippi's first black congressman since Reconstruction and Secretary of Agriculture under President Bill Clinton. He is currently and since 2008 an attorney with the mega-firm Morgan and Morgan in Jackson, Miss., and also runs his own consulting firm specializing in governmental relations, rural development, food and nutrition, and international agricultural development issues.